Vroom vroom! Here come the construction trucks in this new lift-the-flap book from Karen Katz featuring the cutest trucks you've ever seen. Rumble! Rumble! Here come the big trucks! 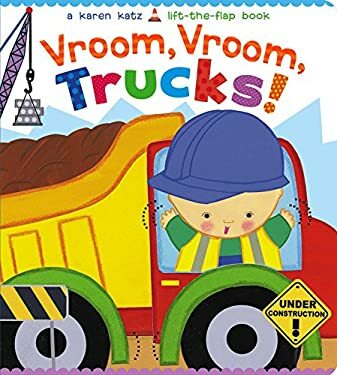 Look for bulldozers, dump trucks, and more in this adventurous lift-the-flap book from Karen Katz sure to appeal to any preschooler who loves things that go and things that build. With Karen Katz's signature bright, striking art, this board book with its sturdy, easy-to-lift flaps is sure to vroom onto bookshelves everywhere. New (104 available) BRAND NEW. Over 1.5 million happy customers. 100% money-back guarantee. Make your purchase count: support Better World Books' worldwide literacy partners.